DMU No. 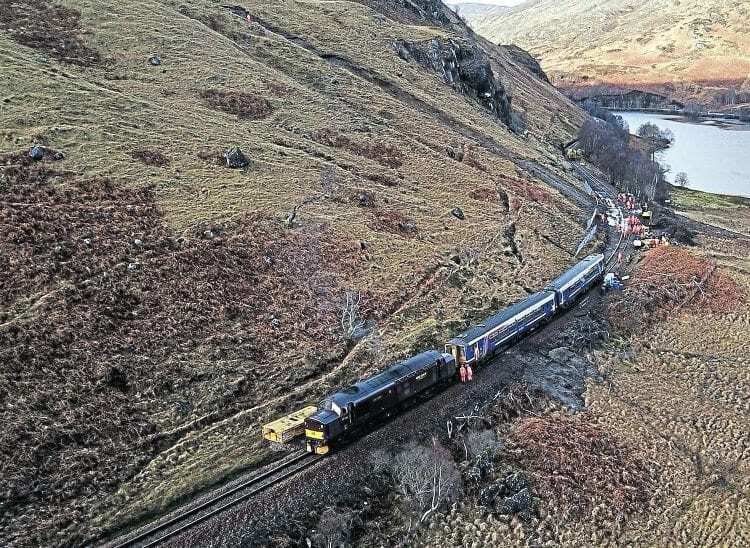 156458 was derailed by a landslide near the eastern end of Loch Eilt on January 22 as it formed the 06.03 Mallaig to Fort William and Glasgow. Five passengers and two crew were aboard at the time, but none was said to be injured. The remote location hampered the recovery and repair in which more than 1,000 tonnes of material was estimated to have slipped down the hillside. The unit was eventually dug out and rerailed before being dragged away by West Coast Railway’s No. 37516 on January 26 and the line reopened to traffic on January 29. Extra drainage was also installed in the area to secure the slope above the line. See more images in the March issue, on sale now.